During the thirty or so hours I spent with Axiom Verge I felt incredibly satisfied, frustrated, confused, delighted, and nostalgic. I ran the entire gamut of emotions while playing Axiom Verge. One second I’d be feeling pure joy after successfully finding a new weapon, the next I’d be incredibly confused after reading a dialogue sequence while obtaining nothing from it. 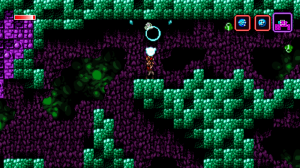 I thoroughly enjoyed Axiom Verge, but many prevalent problems slightly spoiled my experience. Inspired by games like Contra and Metroid, Axiom Verge is a stunningly beautiful pixelated side-scroller created by one man, yes one man. Everything from the design to the music is the brain-child of creator, Tom Happ. Currently only available on PS4, but scheduled for release on Vita and PC, Axiom Verge is an indie game that shows why the digital distribution model is so great. This game wouldn’t be possible without developers having access to a cheap, easy, and widespread distribution model and I’m incredibly glad it exists, because without it I would’ve never had the change to play Axiom Verge. Axiom Verge attempts to tell a dark Science Fiction tale with deep undertones about morality and what it means to kill but does so convolutedly. You begin your journey as Trace, a scientist transported to Sudran, the dark setting of Axiom Verge, at first the player’s goal is to find out where he is and what is going on but all that changes as the plot progresses. The story starts off smooth and simple but introduces many confusing characters and ideas early on. Soon enough I had absolutely no idea what my present motive was. The story didn’t add anything to my experience but an interesting setting, and felt over complicated in a bad way. This further extended to knowing what my next objective was. After a short, over-complicated dialogue sequence or a confusing but beautifully animated cutscene that supposedly tried to give me a hint towards my next objective I was left without a single idea of my next target. From time to time I’d still have a path to follow that’d lead me to my next goal, but there were also times where I’d already cleared out the entire area and was expected to know have a general idea of where to go next. The game doesn’t have any objectives or a hint system and I would have been completely fine with this had the narrative given me a better idea as to what I had to do to progress. Instead I was left spending hours backtracking trying to find out where I was intended to go in order to advance the plot and my character progression. But all of this falls to the side because at its core Axiom Verge is all about fast, Contra-style shooting and metroidvania exploration, and Tom Happ pulls both of these mechanics off with style and excellence. Axiom Verge controls like a dream, a very tight and precise one. Shooting feels amazing, and with over 40 weapons every single play style is accounted for. Want a heat seeking gun of death? Check. What about a hot pink gun that can blow up its bullets on demand? Check. Once I had amassed my crazy collection of death tools I felt as if there wasn’t a situation one of my guns couldn’t handle. Fighting enemies feels fast and satisfying, but most importantly, perfectly compliments the game’s old-school inspired exploration. 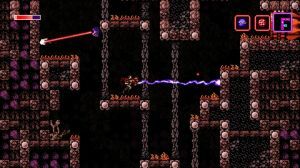 In the same vein as Metroid or Guacamelee, Axiom Verge emphasizes revisiting areas previously unreachable after obtaining a relic that will help you pass by. 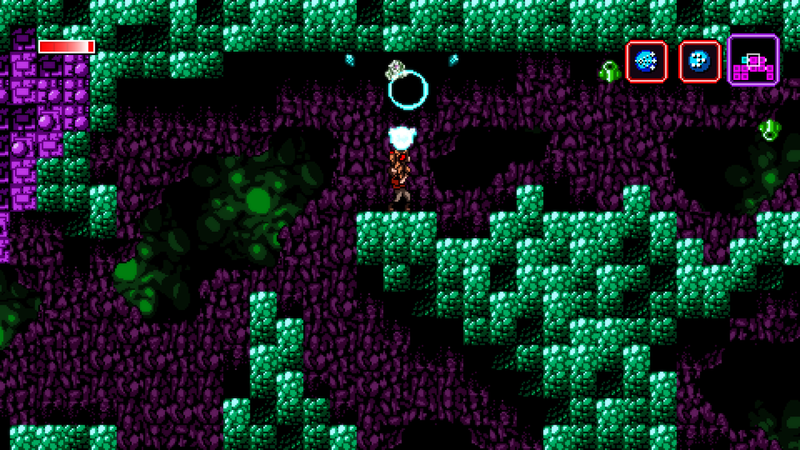 It’s a simple concept and one that Axiom Verge cleverly makes it’s own. Throughout Axiom Verge glitches and bugs litter the landscape and at first it may seem as if you’re game is broken but after obtaining certain weapons and abilities it becomes clear that these glitches are actually barriers to new areas and act a gameplay mechanic. In a game that takes much from the great classics of yore, the glitches in Axiom Verge make it stand apart from Super Metroid and do enough to make Axiom Verge feel like its own. The weapons given to manipulate the glitches can also be used to corrupt enemies and each opponent has a completely different side-effect, it’s interesting and adds a new layer to combat. 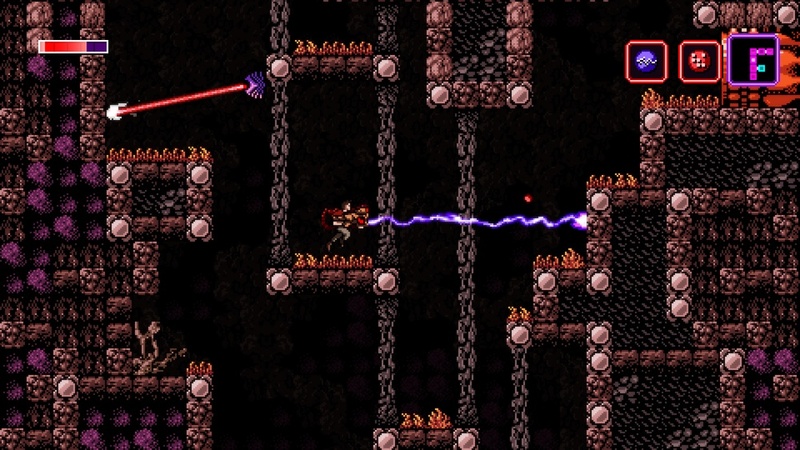 The abilities you procure in Axiom Verge are interesting and make exploring the environment and killing adversaries feel like anything but a chore. The final area of Axiom Verge does this particularly well as it was created with the idea that the player would have every single ability, and aside from the final boss, it is easily my favorite part of the game. Axiom Verge is beautiful. The dark Science Fiction tale it tried to tell was better shown through the glorious pixel art setting of Sudran. Each area and enemy further perpetuated the idea that I was somewhere gross, awful, and dangerous while still retaining a unique feel. The glitches that obstruct the player from moving further are especially eye-catching and suit the environment well. From time to time I put my controller down and stopped playing to look at the beautifully Science Fiction world Tom Happ created. The sounds of Axiom Verge somehow managed to take the aesthetic to a completely different level of excellence. Right from the title sequence the urge to discover and the sensation of mystery was emphasized and invoked. In one excerpt an eerie vocal melody so powerful that I can’t describe with words set the entire mode for that particular precinct, it made me feel uncomfortable and serves as an example to sound design in all mediums. Tom Happ somehow created a beautiful looking, sounding, and playing game and I couldn’t be more impressed. The most innovative thing to come out of Axiom Verge doesn’t even have to do with the base game itself but its modes. The additional Speedrun mode is a pure stroke of genius. The mode is exactly what it sounds like, eliminating all cutscenes and dialogue sequences while adding a timer in the upper left corner indicating how fast you’re playing the game, Speedrun mode creates the perfect environment for any streamer or enthusiast who wants an easy way to keep track of times without the extra hassle of third party software. It’ll even show your times for certain milestones like beating a boss. Speedrunning and video games come together like peanut butter and jelly, but to the best of my knowledge, no game made before Axiom Verge has had an integrated speed running mode. The only downside to the mode is the lack of an online leaderboard, it would have been fun to compare times with friends, the feature would have been the perfect fit for the mode and I’m surprised to see it absent from the incredibly polished Axiom Verge. Axiom Verge’s speedrunning mode is innovative and I wouldn’t be surprised if we see it show up in more upcoming games. Axiom Verge is a good game, one that often feels like a quilt made of patches from other games but that somehow manages to feel great on its own terms. While many problems are prevalent they don’t detract from what the game tries to do-fuse excellent 2D shooting with classic side scrolling exploration. And even though it’s a retro throwback, it adds an innovative speedrun mode that could pave the path for future games. Tom Happ created a fun game and throwback with Axiom Verge and I can’t wait to see what he does next. Caleb Cajthaml is a 15 year old who set dreams so large he needed to get started on them now. Passionate about making people happy Caleb loves to write about all things entertainment. You can find him on twitter @Caleb_Talks tweeting about the latest happenings in the Star Wars cannon and why the Vikings are the best team in football. Thank you.